My informant Bianca Lawrence sent in a great picture taken from Russlyn flats in St Andrew’s Street and looking towards Broad Street. Shown is the old St Joseph’s School where Bianca was a pupil in Class 1. She said she thinks the picture was taken in 1963 0r 1964. I am going to throw a spanner in the works here for as far as I know the picture you show is the school that was known as Convent and not St Joseph’s. The Convent and St Joseph’s were run by the same congregation of Holy Family Nuns. The actual Convent where the nuns lived was situated behind St Joseph’s which was on the corner of Smith and Broad streets. Do a search for St Josephs on FAD for the photo of the original St Josephs. In 1962 the Convent School closed as such and moved up to the new Convent School in Francois Road. The nuns moved up there as well. The old St Josephs was demolished some years before and was redeveloped as the Durdoc Centre which has now changed and been added to. St Josephs was as far as I know a mixed boys/ girls school up to Std 5. When it closed, boys were accommodated at the Convent only for Class 1 and 2. Convent of course accommodated girls from Class 1 right through to Matric. was pulled down when the Durdoc centre was built. Yes the main Convent High School was “handed over ” to Diakonia and the school itself went up to the new premises in Glenmore (I think). There was a small old church behind St Josephs which must have been moved to another site before my time. Hi, Yes I too attended St Joseph’s Convent school cnr of Broad and Smith. Large brick playground with statue of Mary holding baby Jesus (I think). We later moved to the one in St Andrews St when they moved to the Berea. We lived opposite in St Andrews Hotel. Used to run over the road as soon as the bell rang. Happy memories! Sister Clements was also my Headmistress. Gosh she must have been there for ages cos I only started there when I was in Class 2 at around 1957/8. Also remember a Mrs Walker. I have only this minute found out that my first school was St Joseph’s Convent in Durban in 1965. Why can’t I remember this? This is where I learnt my first English. My parents had just arrived from Germany. Yout right Gerald I went to both St Josephs and I stared quite a while because it didn’t look like St Joseph’s. Then I realised it was Convent High which moved to Glenmore in 1962 my Matric Year. I reread Bianca post and see she refers to the years 1963/64. I am not sure if St Joseph’s was re-established at the Convent now that Convent had moved to Glenmore. As far as I know St Joseph’s as a school was not re-opened once the original in Smith Street closed. I am also not sure when the Diakonia Centre took over the Convent School and has remained there to the present day. I attended this school in class one in 1966 and left halfway through 1967. It was definitely this school that I attended as it was right across the road from our flat and my mom would watch me walk there from the veranda. I know that it was a convent school because I remember the nuns teaching us. The headmistress was a Sister Agnes and my teacher (not a nun) was Mrs Spicer. I had a green uniform with a black (or dark brown) beret on which was a badge on which was a picture of a St Josephs lily. The school had an arched passageway leading into a courtyard which had a statue of a religious figure. I will try and see if I can find any documentation or school photographs. Bianca’s comment 11 September. Spot on. I was at St Josephs in Smith Street 1956-1958, starting class 2 and leaving std. 2. Boys had to leave at end of std. 2. which was the case back then with many catholic schools. My sister was at the St Andrew’s Street Holy Family Convent that moved to the Glenmore. St Joseph’s (Smith Street) moved to St Andrew’s Street for several years, after which Diakonia took over. Durban city/central’s young school going population numbers did not warrant keeping St Joseph’s going. St Agnes was around for many years, she that wielded a steel edged 10 inch ruler. Hi Bicana, I was also at St Joseph’s during the same time as you. In fact when I started it was Convent high, then the school moved to Glenmore, I also went up the hill, then I went back down to Durban to what was then called st Josephs school. I remember the following teachers, Mrs Connie, Mrs Hampson, Mrs Jacobs, Mrs St George. I was there from class 1-Std 3. A few of the girls names, Derrian Jackson, Bruce Jackson, Webb girls, the Webber girls, Silva , Loren, Melina, need to pull out my school photos for the rest of the name. Do you perhaps have school photos? Mrs St Joseph taught us, she was the best teacher I had in all my years of schooling. The people I remember was Ronnel Goosen, Gary, Robin (who was from the UK) also a girl called Webb. Wow what a trip down memory lane? I don’t remember the other names but did know a Jennifer Webb ~ she had younger sister ~ one was Ann. Hi Bianca, are you still there? I went to St Joseph’s for class one and class two, I think in 1965 and 1966 or 1966 and 1967. I can’t work out the years. Do you have photos, and do you know if the school’s still around to try to get records? The Convent was in St Andrews Street/ St George’s Street – no where near Broad Street…. St Joseph’s School was in Smith Street on the corner which is not in that photo. The convent living quarters for the nuns with the Junior govt school up to St IV was on the corner of Broad Street. This will take you to a picture of the old St Joseph’s School probably the one you attended 1943-1946. That is a long time ago! I am glad you mentioned that ” behind the school (St. Joseph’s) was a small church that was moved before your time.” I have just read a book “Catholic Beginnings in Natal and Beyond” and in it is mentioned, this very fact. However it did not give the exact location and your comment now localises it. I have done a bit of other research which confirms this and am busy now preparing a post for FAD on this very subject. With the surname Badstubner are you related to Herbie who manged the Torch (?) Garage and Service Station on the Bluff ? I recall he was a Volkswagen Beetle fundi. He was also a keen philatelist and belonged to the Philatelic Society of Natal where I met him originally. Yes Gerald – what a small world…Herbert and I worked at Marine Drive Garage for 35 years…those were the days!! !I wonder if they still have a bus with that name because at that corner the bus turned around and went back to town. The building was sold several times and several different outlets make use of the building today. The previous owner was “Morgy” (Cyril Morganrood) who also used to service the funicular ( ? ) at the Hotel down to the beach. Just for the record my “beloved” Herbert passed away three years ago on 3rd April 2013 sitting upright sorting his stamps on the lounge table. No pain, no drama – just taken peacefully by Our Lord. He an his whole family had their share of suffering during the war in East Germany before OTH Beier sponsored the whole family to live in Durban and work for him in his “wool, lanolin, carpets etc” factory for which I will be eternally grateful. Hi Moira. I remember what I thought was St Joseph’s being in St Andrews street (My granny and I would walk all the way down St Andrews Street to get to school) when I went there for class 1 and class 2, I think in 1965 and 1966. So was I at St Joseph’s or was it a different convent? The original St Joseph’s was in Smith Street where Durdoc is now and was a white building. They might have used the other school in later years as annexed from St Joseph’s. Mrs.Roberts was the cook, meals were served when I was there with my elder brother and two sisters, 1952 to 56, you were friends with my elder sister Catherine. Bryan, do you remember a Robert Donaldson? Had a cousin but can’t remember his name. Oh – it was Mrs Hampson – Class 1 Teacher. Very interesting! For some unknown reason, I googled my old primary school, and came across this reasonably current discussion. The old St Joseph’s was definitely on the present Durdoc Centre site. I’m not too sure how far back it went, but I’m almost certain that my grandmother and her siblings went there around the turn of the 20th century. My mother, Valda Morgan taught there shortly after the war, and then went back to teach at the “new St Joseph’s” at the Diakonia site in St George’s street in 1963, as Mrs Jordan, after having her family. I was one of those boys who attended the convent from Class 1 to Std 2, while the girls went on to Std 5. I was there at the old site from 1958 to 1961, before moving on to St Henry’s. 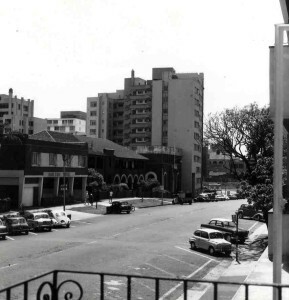 The double move – Convent High up to the Francois Rd site, and St Joseph’s moving to their old premises, with Durdoc Centre being built, happened very soon after I left, and before my mom returned to the school, so it must have been some time in 1962. My younger brothers, Kevin and Chris, attended the relocated St Joseph through the sixties. My mom then moved to Brettonwood around 1970, after the nuns closed St Joseph’s, so it probably survived at the Diakonia site for about nine years. Teachers I remember include Sr Clements, Sr Berkmans (an almost ancient legend) Mrs Hampson, Mrs Williamson, Mrs Davis, Mrs St George, Mrs Spicer, and Mrs Connie. A great foundation for high school and for later life! There is still a little bit of history with Convent Lane running off Broad Street (forgive me, it probably has a new PC name). The time will come when nobody will have any idea where a name like that came from. I hope this helps a bit – and that somebody reads it! Tony I started at convent high, then moved to Glenmore. I then left convent high to go back to the same building, known as St Josephs. I was at SJ from from 63-67. I remember the teachers you mentioned. Do you have any class photos? Mine were lost when my parents divorced, so would be wonderful if you had dome. Sister Clements was my principle when I was there and Sr Berkmans taught me in Std 6. Was she the nun who ran the little tuck shop table? Oooh those do-nuts! I can’t remember the years but I started half way through Class 2 and went onto Std 6 at St Joseph’s. Must be somewhere around late 50’s going through to mayb’64. A couple of names come to mind in my class : Lorraine Molver: Jennifer Webb and there was a Robert Donaldson until he left in Std 2. Too many years back to try and remember! What a strange coincidence, Tony. Your family was well known to my family … Len and Joan Kilburn. I can still picture your mom and dad although I was a very little girl when they were known to us. It may have been in relation to St Peter’s Catholic Church. I attended st Joseph’s school from 1961 at the old school in town then moved to the new site in st George street. I remember sr Clement, Mrs. Spicer and Sr Berkmans who used to sell cream donuts in the tuck shop! I have class photos of those years. Please please post pics ~ I am sure I was there those years. I guess that you are related to Michael and Bronwyn Kilburn. I do remember the Kilburn Family that used to attend Mass at Saint Peters Church in Point Road in the early 1960’s . I was an Altar Boy when Father Joe Theobald was there. If I remember correctly, one of the older Kilburn Girls was in charge of the Boy Cubs that met at the hall opposite the Emmanuel Cathederal. You are absolutely correct on all accounts. Our family were very active in the St Peter’s Parish for many years. Douglas and Michael were altar boys and our parents were involved with the Cubs and Scouts. Our parents were married at St Peters and we attended mass there until the family moved to the Assumption Parish where our parents were parishioners for the rest of their lives. Many happy memories! Thanks for the intel. Good old days. I think that Michael used to work for the South African Railways. I saw him when he was working at the Goods Terminal at Bayhead. I was with the South African railways until 1990. Perhaps you might remember the Hall that was below St Peters Church. My Mom used to play Badminton there. Plus there used to be Concerts. As you say… Many happy memories. Mrs Morgan was my favourite teacher!!!!!!! Hooray Miss Walker was my Std 3 teacher, so Mrs Morgan could have been 4 or 5 or even 6???? before I moved over to the Convent High School. My own mother was a teacher and I would never ask her to help me with homework because I knew I would get a half hour lecture on top of it. Also when we went shopping every now and again somebody would say “Hello Miss Thomas” because that was her maiden name. At the Convent High School I learnt to play tennis on the tennis court originally in the back garden. click on it and it will direct you there. It was a convent however. I was there in the 1950’s. Can’t remember too many teachers names. The chapel was at the front of the school where the building has a rounded section. My cousins use to go to that Convent school. I remember St. Josephs School now. Use to walk to dancing classes. How are you you probably don’t even remember me but would love to hear from you. The white building was where Durdoc is today ~ St Joseph’s. The brick building in St Andrews St was Convent Girls. They moved to the Berea and St Joseph’s took over the building and carried on as St Joseph’s. I was in Std 4 when all this took place. I started in Class 2 at the original St Joseph’s then moved. I know all this as I was there plus we lived over the road at the St Andrews hotel and I walked over the road to school. Std 4, 5, and 6. early 60’s. @ Rodney Leak I do already belong to the FB page as you suggested. I left Convent High whilst it was still in St Andrews Street in 1960. I remember it very well as our flat was in St. Andrews Street and on the same side, so all I had to do was to cross over the traffic lights and walk down to it. What a walk down memory lane as I now live in the USA. Here is a long shot. The block of flats was Kings Lynn, No 94 Mrs E.F. / D.O. Ronaldson? I have been trying to work out where my mother was while my Gran was in the Womens Auxillary Service 1942-1945. I was one of the boys accommodated in the primary school which was known as St Joseph’s Government School when I was there from 1965 to 1967. Boys were only allowed to attend the school up to Standard 2, but I moved to Johannesburg at the end of ’67 and later matriculated at Parktown Boys’ High. Thanks for this history of the school and the photograph – we used to keep our satchels on the balcony in this photograph. The Head teacher was a dear soul Sr Agnes. I remember very fondly the Class 1 teacher Mrs Hampson and the Standard 1 teacher Miss Letzner who got married and became Mrs Arbuthnot. I used to walk across the road from the apartments “Ruwenzori” which was alongside the Albert Park. Very fond memories. I remember the name of my buddy Theo Pretorius – i think he took his step-father’s surname later (Thompson). Wow, this has indeed jogged my memory. Thank you for the comments written above and the memories come flooding back…I attended St Joseph’s on the corner of Smith and Broad Streets from 1959 to 1961( class 1 to standard 1 ). My teachers were Mrs. Williamson, Mrs. Spicer and Miss Shepherd. I also remember Mrs. Hampson. The Principal was Sister Clement and I often felt the fury of her cane on my behind for talking in line while we were marching to military music on our way to class! Names that I remember: Alf Fernandes, Stephen de Mews, Dianne ( I still have the children’s Catholic Bible verses book she gave me. ), Reynold Silva, John Cardinelli, Ann Webb, Steve Fourie. Yes, those donuts they sold at school were amazing as was the Sky High bubblegum we used to buy at the shop next door to the school…. Hi Nick I think you were behind me. The only name I remember was Ann Webb. I think she was the second to eldest of 3 or 4 sisters. Jennifer Webb was the eldest. Either my year or one above. Teachers names all familiar. I to was under Sister Clement. Loved the doughnuts sold from Sister Bertram’s (was that her name) little table. Do you perhaps remember a Robert Donaldson. Hi Moira, I remember a Robbie Donaldson from my Glenwood High School days who played first team rugby in 1968 in his matric year. If it is the same Rob Donaldson you are asking about, he is 2 years older than me and so he would have been at St.Joseph’s from 1957 to 1960. Robbie’s Dad worked in a barber’s shop on Umbilo Road near the Mac Donald Road intersection and many a Glenwood High boy would go to him for a haircut after being caught at assembly haircut check! I had short black hair and a fringe and I used to visit the Barber on the corner of Davenport Road and Umbilo Road. When we were too short we had to sit on a board which rested over the arms of the chair!!!! If that was the barber shop on the corner, I remember it as I used to go there as well. Now I wonder if the barber I remember, a short stocky man with thinning hair which he combed into a ducktail at the back. 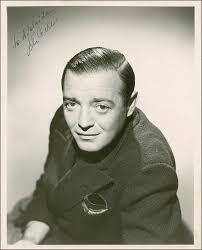 Why I remember him is because he looked like the Hollywood actor of the 1950s, one named Peter Lorre. I got this picture of Peter Lorre from the internet. Am I on the right track or way off beam? Hi Nick, That sounds about right. I am 65 now and was in class two with Robert (Robbie) Donaldson. I would’ve been in matric about that time but chose to go on and be an apprentice hairdresser instead!! Wonder where he is today. By the way were you at GBHS when a Mr. Mike Lotter taught there? Not sure if he was after you? You mention a Mr Mike Lotter. When I taught in Northern Natal (Dundee) about 35 years ago a Mr Mike Lotter was a very senior Education Department official in charge of the region. Short in stature, but with a huge personality and a fine gentleman I remember him to have been. Any idea if this is the same person you are speaking of? Yes it is Paul, he is the brother of my late husband. He is retired now and is still in Dundee. As you say a fine gentlemen. He was previously at Glenwood prior to being transferred and promoted to Dundee. Just a bit of useless info ~ I lived in Vryheid for many years late 60’s ~ mid 80’s. Mike Lotter great teacher and fair rugby coach. He was at Glenwood in my years there. 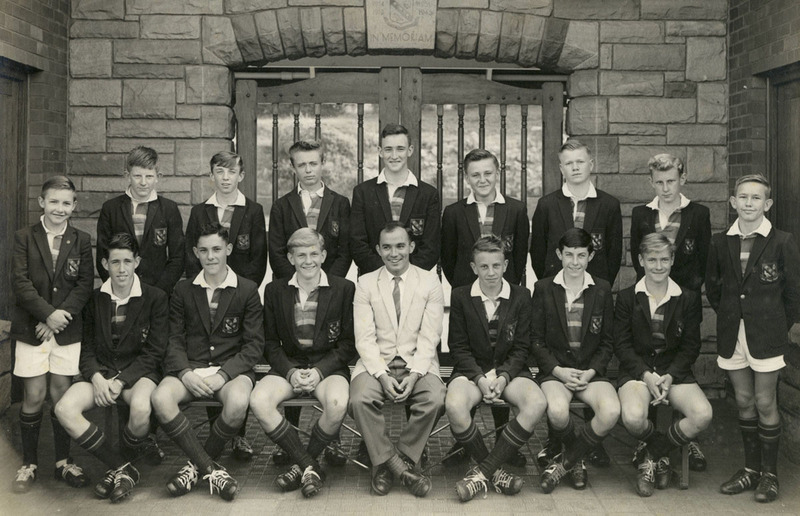 I have an Under 14a rugby team photo of 1963 with a young Mike Lotter. Give Mickey my regards. I was a ’66 matriculant. Gerald how do we get photos up? Send them to Allan Jackson via Contact Us on the masthead. HI Moira, I must say I am really enjoying this trip down memory lane! I was at Glenwood High from 1966-1970 and had the privilege of being taught English by Mike Lotter for three years from 1968-1970. He instilled a huge love for the English language and literature in me. Rodney Leak, I remember you as a prefect at Glenwood High and playing first team rugby when I was in St.6 in 1966. ( we had to memorise all the prefect’s names on pain of at least two cuts if our memories lapsed!). Gerald, I am sure you are on the right track about the barber Mr. Donaldson, Robbie’s Dad! First off thanks to Allan for uploading the photo with Mike Lotter. I ditto what Nick says about Mike Lotter and English. Nick not the best way of being remembered! I hope you were never whacked by a prefect. There were a couple of prefects who (ab)used the bamboo. If I recall the prefects dugout was adjacent to the refectory run for yonks by Ma Fouche. Nick did you have a sister at St Josephs ’56-’58? Rodney, my sister Katherine was at St. Joseph’s from 1966-1972. Sister Agnes was the head mistress. Some more names have come to me of fellow pupils during my years at St. Joseph’s from 1959-1961: Mark Matthews, Mark Fourie, Louis Barbosa, Nadine, Lilian( Italian), Malcolm,Alex, Pierre ( whose uncle owned/worked at the Tropicale Restaurant in Albert Park). Another memory comes to mind: I came from a Greek Orthodox family, so as a non-catholic I had to join the other non-catholic children in the playground before school, while the catholic kids went to mass. However when things got a bit hot with some older and stronger boys who wanted to sort me out, I would boldly declare that I was a catholic and thus entitled to hide at mass. Sister Clement, the headmistress, got wind of my vacillation between Greek Orthodoxy and Catholicism and decided to call in my Mom to settle the matter. My Mom proudly declared that I was indeed Greek Orthodox and so my convenient escapes to mass sadly came to an end…. That small restaurant at Albert Park was so popular in my days. You sometimes had to battle to find a spare table!!! Nick the names are after my time at St Josephs. I left in 1958 to finish primary schooling at Park View (now Glenwood Prep). The owners of the Tropicale were the Poulos family. George the son and I were playmates and shared a defining time in the Air Force in 1967/8. George went to St Henrys. Rodney, I remember George Poulos well as he was part of the Durban Greek community as was George Thomopoulos (Thompson) of Springbok surfing fame. I managed to find my 1959 class 1 photo at St.Joseph’s and can now name some more pupils from it: James, Nick Cardasis, Neil, Yvonne, (very blond), Sharn, Eric Rivalland, Phillip, Kind Pastellides, Ian Mackintosh, Barbara Cassidy and Patricia from Kenneth Gardens. Anyone out there know the whereabouts of any of these folks? Rodney, my friend and fellow Greek Perry Velalis spoke of you with admiration. He was 2 years behind you at Park View and Glenwood High and lived in Russlyn flats in Russell Street. His sister’s name is Melina, mentioned by Lorraine Myburgh above. I also knew the Poulos family and George Thomopoulos,who if I remember right went to work for a coffee company in Brazil.Some sad memories too,premature death of Harry Poulos past member of Four Jacks and a Jill and Freeddom’s Children. please give him my regards. A Pastellides also lurks in the grey matter. Two names in that listing I know. Philip Pasteliddes and Louis Barbosa both started there careers with Telkom in the Engineering Section. This would have been in the 1980s. Reading this brings back memories. I was at St Joseph’s from 1961 (Class 2) to 1963 ( Standard 2) I still remember the original School ( Now Durdoc Centre) and the move to the newer School , as in the photo at the top of this page. Mrs. Bull used to be the Crafts Teacher. There was also Mrs. Jordan, Sister Anthony. The Pupils that I remember are: Jean Bestel, Jennifer Columbo, Michael Diamond, Robert Letilier. Terence Kaden. I still have the School Reports + Photos from that time. I stumbled on this site while looking for an old friend, Nicholas Cardasis. We were at St Josephs both old/original and new premises (old convent) in town from 1960 to 1964. From there we went to St Henry’s Marist Brothers where I remember you from Std 6 on wards. Some of my class mates were Michael Diamond, Andrew Murray (his mom was the art teacher),Garth Wertheim, Ian Simpson, Vincent Hatch, Jenny Columbo (saw her about 8/9 years ago at Assumption Church but have since lost contact), Kent Pastilides, Diane Roper and Jennifer Parr. I have been in Ireland since 1998. I care for my Mom full time now . She is 88 Years old. My Dad passed away in December of 2010. My Step Dad passed away in 2011. So I guess that you are still in the Legal Profession. The years have passed by so quickly. Im now 63. I do music production in my spare time. have written and produced +- 45 Tracks. I would like to get in contact with you about a matter in relation to something of a Legal nature. I am on Face Book and Linked in. Wow! This brings back memories. I was at the school from 1960 (class1) to 1966 when I went to high school. Do you know when the school moved to St Andrews Street? I have a class photo from 1961 showing the School in Smith Street but I don’t remember being there. I only remember being at the school in St Andrews street. Sister Clement was our principal and I remember, Mrs Hampson, Miss Shephard, Mrs Walker and Mrs Carson. Francis, do you have any photos as I was also in Class 2 in 1961……..
That happened in 1962. see this link https://www.fad.co.za/2012/01/13/durban-events-50-years-ago-1962/. Related to the Chelins of Woodlands/ Montcalair? Yes, we lived in Montclair but there was also another Chelin family in Woodlands.My brothers went to New Forest High School where there were other Chelin boys in their class. Which Chelins did you know? I knew Brian (?) Chelin from St Henry’s Marist Brothers. Thin wiry boy. This was about 1954 to 1955. He then left and was not in High School with me. I seem to recall Chelins had to do with a plumbing business. Mybe wrong on this. No, definitely not my family. We are from Mauritius and arrived in SA in Sept 1956. My brothers went to primary school and high school in Woodlands. None are or have been in the plumbing business. I had a Morris or Maurice Chelin in my class at Montclair Primary and later at New Forest High, circa early through late 1960’s. I seem to recall that his family lived in Montclair Road near the intersection with Anleno Road opposite or near a church. Would that be your family by any chance? Actually thinking about it, Morris or Maurice may have been from the other Chelin family and perhaps it was Marc Chelin who lived in Montclair Road. I had both in my class but I think in different years. I’m getting old and the brain doesn’t work so well any more. Yes you are correct. Maurice Chelin did not live in the house in Montclair Road. That was our house and Marc is my brother. Maurice was at school with Marc but he is not related to us. I think I once visited your house possibly in 1961. As a 9/10 year old I was fascinated by the sight of a radiogram that had push button radio station selection and a turntable all built into a modern cabinet. Of course this may not have been your house as once again my memory isn’t what it used to be. My parents still had an old fashioned valve radio that took anything from about 30 seconds to a minute to warm up before there was any sound and the turntable was a separate wind up device which only played 78’s. About a year or so later my father invested in a Pye radiogram and finally the 1960’s had arrived. I seem to recall that Marc had quite a strong accent which he retained even at high school. With hindsight I wonder if that was because only French was spoken at home, please correct me if I’m wrong. Also, did Marc first go to school at the Assumption Convent in Kenyon Howden Road in 1957? I have a photograph (don’t panic) taken when I was there and I’m sure that Marc is in it, Sister Mary was our class teacher. Maybe I can send it to you via this web site, you may be able to name some of the other children in it as I can’t recall most of their names. For someone who says their memory is bad, you certainly remember a lot from way back when! I don’t think I will recall anyone in your photo from 1957 as I was only 3 then. We arrived in SA from Mauritius in Sept 1956 and yes, we spoke only French at home. We couldn’t speak a word of English when we arrived but that slowly changed over the years from having to go to English schools. My parents still found English a bit of a challenge though. I don’t think that Marc went to Assumption Convent, I only know of one primary school that my brothers attended and that was a government school in Woodlands. I went to Assumption Convent from grade 8 to Matric. I remember the radiogram that you mention, my father built those! From scratch! We did have a radio with the valves as well that he built. I have a sense that we bumped into each other in our 30’s? In Pinetown? I think it was Checkers…… was that you? I had someone from way back when chat to me about old times, not sure if it was you? I’m shocked, here I find Russlyn flats where I lived in the 1970’s,last flat 1st floor, and my mother in law lived on the 5th floor.Now I live in France.Brings back memories galore. Linda and Anne Lubbe were at St Joseph’s 1962-1968 and 1959-1965 respectively. We lived in Kings Lynn flats.St Joseph’s was originally where Durdoc is, but moved to what had been Convent during 1962, the premises situated between St Georges St and St Andrews St. Other teachers I recall:Mrs Harwood, Troskie, Shackleford, Nauru, Meyer. Mrs Naudé, not Nauru! Also Mrs Royston, Mrs Oliver, Miss Grey, Mrs Roach. Hello Linda, I attended St Joseph’s from 1962 until 1966. I was in your class. I remember you being a Maths wiz! My sister, Bronwen Kilburn was, I believe, in your sister’s class. I also remember Donatella Lauri and Felicity. Wonderful memories of St Joseph’s and especially the teachers who I remember fondly. I was inspired to become a teacher and have taught for 35 years. Hi Sandra.Yes I remember you and many others in our class. I remember your sister Bronwyn but couldn’t recall if she was the same age as Anne or a bit younger. Don’t know so much about the maths…in our day at that level i think we were still busy with Arithmetic! I left Durban for Bulawayo a couple of weeks or so after leaving St Joseph’s. What a change it was for me having no friends to start high school with in a strange place too! My besties back in those days were Gayle Ostler, Leigh Mitchell and Joan Sole.Gayle was also a teacher..became a Wolfvaard (don’t know now), Leigh became a Connell and Joan married a social anthropology lecturer from University of Natal, Jeff Thomas. One or two of the prior contributors mentioned the Webb sisters Jennifer and Anne. The younger sisters were Shelly and Dawn. The Felicity you remember I imagine was Felicity Baumgart (?) who had 2 sisters at St Joseph’s too, Patricia and Cheryl If I recall correctly. In the year in which Anne was in Std 5, they had the last batch of Std 6 girls(1965). We had boys in our class only until Std 2:Mark Horton, Carl Hansen (? )and Ian Walker spring to mind. Of course some of the girls from those earlier years were no longer with us by Std 5..I’m thinking of Jacqueline Moonie, Sylvie Bestel and 2 girls named Stephanie and Terry…can you remember their names? There were probably more! I often noticed Gudrun Kaiser’s name as a member of staff of Fair Lady magazine. I think she only joined our class in Std 5 when she arrived from Canada. I found myself working extra hard to try and retain my place in class against her both in a personal sense and a national sense. We were then in Mrs Jordan ‘ s class. Do you know anything about Avril Plinth? She used to go to the same ballet teacher as Anne and I..Miss Chapman..was it Athella? A few of the kids from St Joseph’s and the Albert Park area used to play tennis at the Durban Lawn Tennis Club in Albert Park, and also used to attend Sunday School at the Durban People’s Church in Russel Street. What a lovely place Albert Park was in those days…except for the bullies…I was on the receiving end from a group of older girls and boys! Not as bad as modern bullying I am sure, which seems to be quite out of control! should you or anyone else be interested. Oh sorry, Sandra. I see, on re – reading your reply, that you left St Joseph’s in 1966, so that was when we were in Mrs Jacob ‘ s class (Std 3). The next year we had Mrs Harwood then in Std 5 Mrs Jordan. Does anyone know what actually happened to the Webb girls? I started in class one at St Josephs in 1946 then went on to St Henrys Marist Bros. I remember coming out of school one day on my way to catch a bus home and saw an African chasing an Indian with a panga, it was during the riots in Durban. I’ve known two other scholars, both women, but both have passed on. Sister Clement was the head mistress and in those days we had a hot lunch, and assembly under the large tree in the morning, after which music was played as we marched off to class. I have just read your response dated 30 March 2017. Please contact me via email. I would be happy to assist you where I can. My word, how interesting! I attended St Joseph’s Convent, as my mom called it, from 1968-1970. Class1&2, and Std 1. I remember Sr Agnes, Ms Connie, Ms Hampson and Ms Trotskie. We lived in Tabora Flats in Park Street, and my mom used to take me to play in Albert Park. Debbie, what was your mom’s name? My sister Michelle and I were there at the same time. Our surname was Hanegraaf. My mom was called Margie. Our surname was Essex. Hello Brigitte, I don’t mean to intrude on your conversations, but are you part of the Chelin family who had an Estate Agency in Marine Drive, Bluff some years ago?. No, not the same family. My father was an industrial chemist. I was looking for Holy Family (Convent) High School old girl’s group and saw this post. I was at St Josephs from either 1966/1967 to 1970. We also played in Albert Park. I remember Sister Delores, Sister Agnes, Mrs Ashort and Mrs Ducase (not sure of spelling). My sister Michelle was also there. I remember what I thought was St Joseph’s being in St Andrews street (My granny and I would walk all the way down St Andrews Street to get to school) when I went there for class 1 and class 2, I think in 1965 and 1966. My grandparents used to manage the block of flats called Granchester which was opposite Albert Park so we played there too. Hi Carey, what were your grandparents names and when were they caretakers at Grantchester?